BlackBerry Q10 release date: when can I get it? 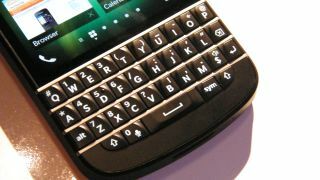 The BlackBerry Q10 is the second handset to come running the new BlackBerry 10 operating system, but it's the first to offer a physical QWERTY keyboard alongside it. The Q10 won't have the same appeal as the flagship Z10, but there are still people out there who swear by a physical keyboard on their smartphone, so we've searched far and wide to bring you the latest on where and when you'll be able to get it. Carphone Warehouse has reduced the price of BlackBerry Q10, with it now listed at a still rather eye-watering £579.95 SIM-free (it was appearing at £600 originally), which is the same as the Samsung Galaxy S4. You can also pick it up on contract for free from £36 per month - with all the major networks apart from Three represented - with stock expected to arrive "by the end of April". The Phones 4U site tells us it expects stock of the BlackBerry Q10 to arrive "in 4-5 weeks" and it's offering a free BlackBerry PlayBook to the first 300 who pre-order - we're not sure if that's an incentive or not. Like Carphone Warehouse you can grab the Q10 for free on two year contracts starting at £36 per month, but there's no sign of Three or O2 here, nor does it appear to be offering the handset SIM-free. EE announced at the launch of the BlackBerry Z10 in January that it "also plans to range the forthcoming BlackBerry® Q10 smartphone. Details on pricing and availability will be announced at a later date". And we're still waiting on those prices and release date. O2 reckons we might have a bit of a longer wait here in the UK for the BlackBerry Q10, with a coming soon date of May and the option to "keep me in the loop" on its info page. Three is yet to announce whether or not it will be ranging the BlackBerry Q10, but considering all its rivals will be selling the phone we'd expect the data-friendly network to follow suit. Update: Vodafone now has its BlackBerry Q10 pre-order page live and is offering the handset for free on a two year, £37 per month contract which gives you unlimited calls and texts plus a distinctly average 1GB of data. There's no word on the Q10's release date however, nor does there seem to be PAYG or SIM-only options on Vodafone. Unlocked Mobiles has the handset listed for pre-order at £529.98 and a Blackberry Q10 release date of April 26. The Q10 is slightly more on Clove's pre-order page, with a price of £534.99 for the SIM-free handset and a note saying "first stock due late April". Update: You can pre-order the BlackBerry Q10 at Expansys, but it's a bit pricier at £579.99 for the QWERTY keyboard device.